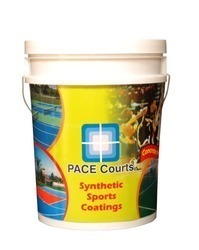 We Balaji Sports Co. only One Manufacturing Firm dealing in Synthetic Sports Surfaces. Being one of the well-known firms, we are able to offer our patrons an elite array of Synthetic Sports Surfaces. Offered coating is precisely formulated at our well-furnished fabrication unit by making use of top-notch grade material which we obtain from certified vendors of the market. In addition to this, personnel working at our end with highly advanced machines, latest tools and modern equipment in order to design product as per set industry norms.